Make Your Guided Reading Groups Run Smoothly & Efficiently With These Ready-Made A - Z Guided Reading Lesson Plans! Resource Prep: Make a copy of as many plans you feel needed. I personally made 5 copies of each plan and put them in a clear sleeve. Make a copy of each A - Z book you are using and placed it in the sleeve with the coordinating plan. For easy use and access, I would put all my plans and booklets into one binder. Make a copy of the book for each student, the books can be found on the Reading A-Z Leveled Books site, https://www.readinga-z.com/books/leveled-books/ A parent helper is a great resource to make a book for each student and then just house them where you can in your classroom for easy access. 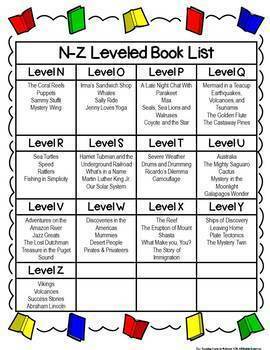 A - Z Leveled Book List: List of books and their levels included in this resource. Leveled Readers A - Z and DRA Grade Equivalent Charts: Easy readable chart that compares leveled readers with DRA books and Grade Equivalence. Editable Guided Reading Plan: Editable Guided Plan for you can type in your own plans for other books you may have. Just start typing in fields where text should be. 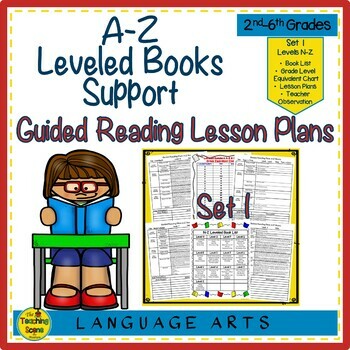 A-Z Guided Reading Plans: Levels N - Z (4 books per level): Guided reading plans for the Reading A-Z Leveled Books make guided reading sessions run smoothly and efficiently. Each plan states the lesson objectives and lists what you should do before, during and after reading the book. It also provided extension activities to be used for the book. 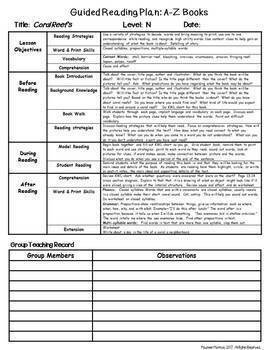 When doing plans each week take the guided reading plans needed from the binder for your guided reading groups and fill out the Teaching Group Record. During your guided reading sessions follow the plans and writing down the observations made about students during our guided reading session. Students would keep their individual books in their reading tubs for the week to practice and then they were sent home to practice with their parents. Students received two books per week to practice. 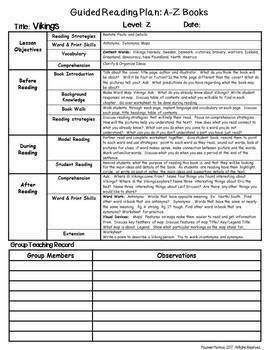 Guided Reading Teaching Group Record Sheet with Observation Space: Included in on the charted plan is a place to write down students names in that particular group and an observation space for each child. You can refer to these notes during individual reading conferences with students and work on individual skills or strategies the student may need at that time. This is also a great resource for parent/teacher conferences to let parents know what their child’s strengths and weaknesses are as a reader. Note: When my school went to the Reading Street Reading Program I still used these books and plans., I would use one book instead of two during the week. I thought it was important that students were able to take books home at their reading level to practice with their parents. Secondly, I found that Reading Street did not meet the needs of all my students, especially my lower and higher groups of students. I found this resource helped both these groups be successful readers at their ability level. Make your guided reading groups run smoothly with these easy ready-made plans!